An aerial image of the site captured by the Duke University Marine Robotics and Remote Sensing research group. In 2017, the North Carolina Coastal Federation was awarded a grant from the National Oceanic and Atmospheric Administration (NOAA) Marine Debris Program to clean up abandoned mariculture gear near Harkers Island and create a best management practices (BMPs) guide for shellfish mariculture. The project removed tons of debris left behind from a clam-growing operation that went out of business decades ago. Plastic, netting, cages, buoys, pipes and ropes created navigation hazards and littered salt marshes, seagrass beds and oyster beds. The shellfish mariculture industry heavily relies on placing man-made gear in the marine environment. Producers are aware of the negative impact that gear can have if it escapes the farm and want to be proactive in preventing that from happening. While most shellfish growers are good stewards of the environment they rely on, storms and other natural disasters can lead to gear breaking loose as well. 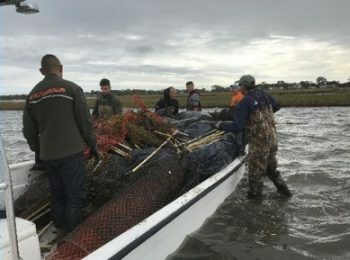 The federation partnered with industry experts from NOAA, North Carolina Sea Grant and commercial shellfish operations to develop best management practices (BMPs) for the prevention of marine debris from the shellfish mariculture industry. These BMPs provide a guide for new growers and lease applicants to follow to make their best effort in keeping gear on the farm during normal operations as well as in preparation for a storm. In November 2017, 52 volunteers from Cherry Point Marine Corps Air Station Cherry Point participated in cleanup of the shoreline at the Harkers Island site. They helped remove approximately 3,000 pounds of debris that was blown ashore over years of storms. Some of the volunteers joined James Morris, ecologist at NOAA, on a boat to collect pilings and PVC piping at an offshore portion of the site. 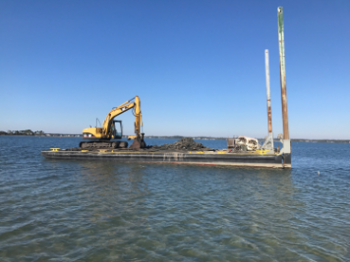 A local contractor, Brooks Dredging and Marine Construction Inc. also worked for a full week in December 2018 to remove embedded aquaculture debris from public trust bottom. They removed 21 dump truck loads from the site, with a total weight of 590,000 pounds of sandbags, pilings and screens. The Duke University Marine Robotics and Remote Sensing research group monitored the site for recovery of marsh and sea grass used fixed wing and rotor drones. The study provided valuable methodology for differentiating artificial substrates from natural substrates using aerial imagery.